From September 1997: STARBURST MAGAZINE celebrates its 20th anniversary with a bumper issue and free cover-mounted CD (something of a luxury for the usually gift-free Visual Imagination titles). Sadly the CD has parted company with this issue that I acquired recently. That stall 83 seems to be the gift that keeps on giving. I still have that cd of theme music and even the outer wrap for the mag. However I'm still looking for a similar cd given away with SFX. Back in the day when such magazines would include free goodies with every issue. As rare as hens teeth now. 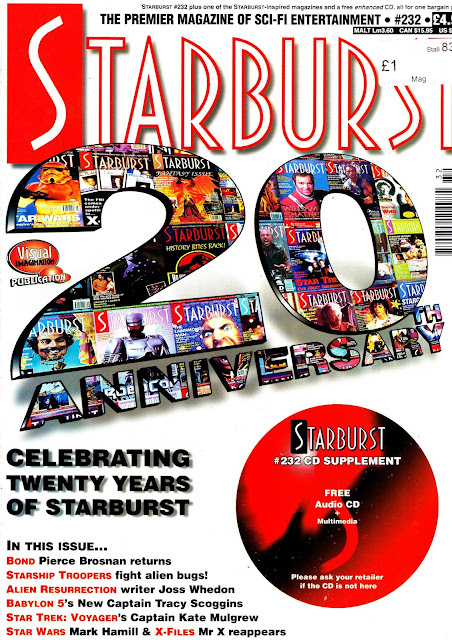 The ' starburst inspired ' mag was most likely one of VI's own. If memory serves, it was a back issue of SHIVERS. The editor seemed to think that SB had been the impetus for other uk SF mags but its more likely they arose from the SF boom in the latter half the 90's.